in central Auckland - an edge of wide sandy beaches, rocky cli s and mud ats. The Ngāti Whātua leader, Te Kawau’s gift of the land of Auckland CBD to Governor Hobson in 1840 set in train the transformation of the waterfront. By the early 2000s these uses were no longer needed. Instead, an Urban Design Framework was developed by Architectus to transform the area from industrial port into harbourside community – a space for people to live, work, visit and play. Kaitiakitanga, guardianship, forms the basis for a redevelopment that is human-centred, low impact and environmentally aware. This enables a rich mix of residential, commercial and ecological development alongside existing shing and marine industries – sustaining and renewing stories in a multi-layered cultural landscape. This walk explores the Wynyard Quarter from east to west and then north to south, journeying back to the 1840 foreshore on Fanshawe Street. It focuses on the award-winning landscape designs that de ne this space and re ects on histories that together shape its story. 1. This optional additional loop gives a picture of the various industries that previously covered Wynyard Quarter, soon to be developed into mixed-use residential, business and recreation. 2. This area is to become Wynyard Commons, a contemporary open space at the heart of the quarter’s north-south axis. A wero is a challenge usually performed at the beginning of a pōwhiri, a welcoming ceremony. It is a tting name for this landscape of procession which links Tāmaki Makaurau’s waterfront from east to west. The bold bands of colour edged with mobile seating structures and pohutukawa trees create a strong directionality which culminates in Te Wero bridge – a moment of connection, encounter and welcome. Te Wero Bridge was installed in 2009 as an “interim solution” – part of new infrastructure to accommodate the 2011 Rugby World Cup. Like many other key elements in Auckland’s cityscape, what was devised as temporal infrastructure has embedded itself into this place. Crossing the Viaduct Basin is a reminder that the entire waterfront is a claimed landscape structured over the waters of the Waitematā. To the south rises the CBD; to the north east is Rangitoto, “bloody sky,” the most recent and largest of the volcanoes that underlie the isthmus. Karanga means to call out, to summon – and as the eastern gateway into Wynyard Quarter this plaza provides a broad welcome after the tight funnelling of Te Wero bridge. The plaza not only mediates the east-west axis between the city and Wynyard Quarter: it creates dialogue between the urban realm and the sea itself. A tidal stair descending into the Viaduct Basin creates opportunities for engagement at the water’s edge while giant mobile lounger seats allow creative appropriation of the square for personal recreation and large scale events. Check out the information kiosk in the stacked shipping containers for what’s on. This promenade continues the journey into Wynyard Quarter’s marine archaeology, historical uses and new vision. The landscaping here deliberately weaves connections between contrasts – a living maritime precinct with contemporary public space, gritty working wharves with alfresco dining. Sit on the brightly-coloured crate seats and experience urban form that’s not over-sanitised – the old timber wharf structure, bumper tyres, mooring bollards, tram tracks, rough concrete – it’s still all here, enweaving the present with industrial pasts. The Auckland Fish Market has been on Jellicoe Street since the 1920s and its continued occupation here re ects the mixed-use development of Wynyard Quarter. Jellicoe Street’s landscaping deliberately contrasts with the hard and exposed character of the parallel North Wharf. 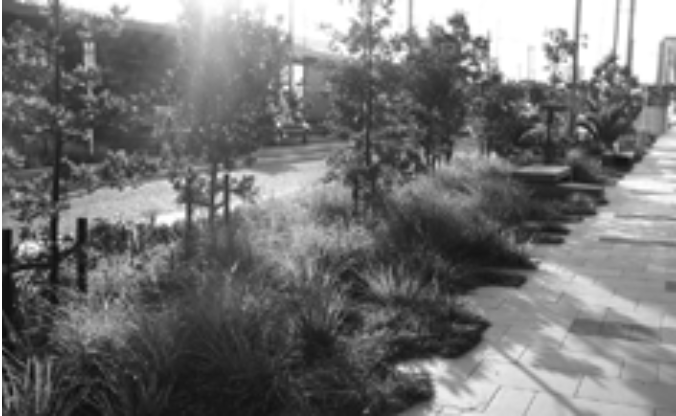 The carriageway dimensions are deliberately narrow to prioritise pedestrian circulation and to provide space for generous rain gardens that feature indigenous plant species and signi cant trees. The street as a shared zone includes public transport, with the quarter’s trams passing regularly. Jellicoe Street and North Wharf both terminate in Silo Park, a former cement depot and now a public space for recreation, events and markets. The landscape is de ned by large remnant cement silos to the west and a 100-metre long steel gantry structure to the north that evoke the site’s industrial history and generate opportunities for creative site engagement. 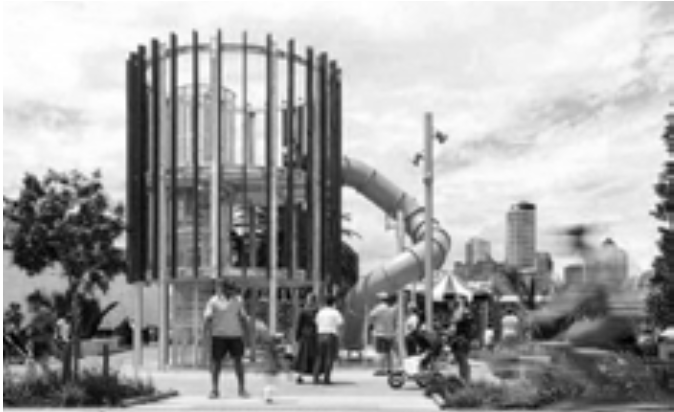 A large playground and water-play area features the Wind Tree water sculpture by Japanese kinetic sculptor Michio Ihara. On the east-west axis a long bio-retention wetland culminates in a water stair that acts as both rock armour for the shoreline and a place to experience the dramatic coast. Daldy Street is designed as the Quarter’s key north-south axis – a journey between Tāmaki Makaurau’s original (pre-reclamation) northern edge and the waters of the Waitematā. This hybrid landscape is laid out as a series of episodic elements along an axial corridor that incorporates vehicular and tram movement with ecological planting and play spaces. The design draws on the site’s native coastal vegetation, marine archaeology and post- industrial character to shape its urban form. The Daldy Street linear park will soon be extended to connect through to Victoria Park. The site’s industrial heritage is referenced in the VXV Plaza’s strong historical narrative that is the driver for its layout, materiality and street furniture. Environmental sustainability continues to be highlighted here with the use of sustainably sourced timber and the incorporation of stormwater treatment in a highly contaminated area. The dynamic interplay of timber platforms and pathways with lawns, pōhutukawa trees and rain gardens provides respite from the surrounding built form and a place for informal gathering.